Founder and creator Julia Lambie of Flying Wish Paper™ just let me know about her latest kit, Flying Wish Paper™ PINK RIBBON, $8.00, with a portion of proceeds benefiting breast cancer. 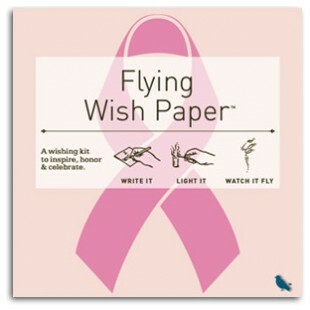 Flying Wish Paper™ is one of the most unique gift ideas I've seen and so incredibly timely. During spring it seems like everyone involved in positive thinking is touting the benefits of letting go of the past by throwing them away, quite literally. With these tiny kits you can write everything you want to let go of, burn them and let the negativity fly away. "I chose breast cancer because my good friend, Renee, is a survivor. You would think there is plenty of awareness and education out there, but it really takes a personal experience to make you think...hey, this could happen to me. I am hoping to target my dollars toward literature or other promotion to encourage women to - well - touch themselves and potentially save their own lives." This is the first in a series of Flying Wish Paper™ kits being created in the series and Julia tells me that she is looking for more charitable causes to partner with. If you're interested in working with Flying Wish Paper™ for your cause contact Julia Lambie at her website www.flyingwishpaper.com. At the Flying Wish Paper™ website you can also sign up for that latest release updates, specials and news.